TPC Sawgrass Stadium Course Hole 4: This short par four is one of the best scoring opportunities on the course (there aren’t many) as the fairway is relatively wide and the approach, although scary, is made less so by using a short iron to the green that slopes from right to left and back to front (towards the water). TPC Sawgrass Stadium Course Hole 5: Typical of the par four holes on the course, this one is long and has sand and water in play. 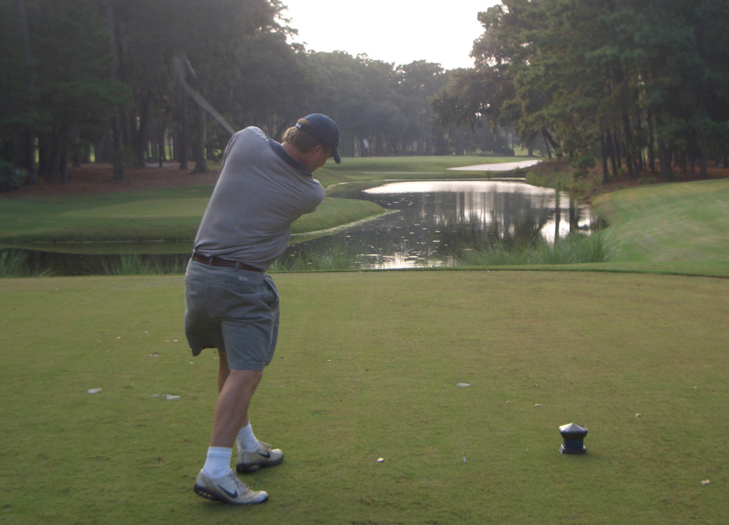 In this case, the water is on both sides of the fairway, although that on the right is much more likely to be found as the water on the left is actually through the fairway and only reachable by the longest of hitters. The approach to the green is then surrounded by mounds and palm trees. TPC Sawgrass Stadium Course Hole 7: As usual, the drive is tight here and must avoid water (on the left) and bunkers on both sides. The second is also tough, especially if the drive is not in the fairway. TPC Sawgrass Stadium Course Hole 10: The definition of tight, this dogleg left requires a perfectly shaped drive to find the fairway and avoid the water, bunker or woods surrounding it. The second then must find the raised putting surface that is surrounded by bunkers or slopes rejecting less than perfect approaches. TPC Sawgrass Stadium Course Hole 11: This fantastic par five features a uncharacteristically wide landing area for the drive. But, the second shot has options, depending on the drive and the nerve of the golfer. Lay-ups are afforded right and left of the central water hazard, or the adventurous player can go for it in two. However, any miscue on any of these shots will lead to penalty strokes or a tricky deep bunker shot. TPC Sawgrass Stadium Course Hole 13: This is a solid par three with water short and on the left. The green has an upper shelf to the right and a lower shelf to the left. Thus, the precision shot to have any chance a birdie (and, for the average putter, to avoid 3-putt), requires aiming for only one half of the green or shaping the shot appropriately. TPC Sawgrass Stadium Course Hole 14: Another brutally long par four, this one features water off the tee on the left and huge mounds on the right. The approach will be with at least a long iron for the normal human and must stay on target or it will find trees or bunkers left or right of the green. TPC Sawgrass Stadium Course Hole 15: Tight and long, this par four bends to the right and has a huge collection bunker on the inside of the dogleg. The green is not surprisingly tough to hit and putt as well. TPC Sawgrass Stadium Course Hole 16: A famously short par five, the 16th is reachable in two by a drive that draws or cuts the corner of the dogleg left. The 2nd or 3rd shots will need to find the green or suffer the water consequences to the right. Left leaves a strategic tree, mounds or bunkers to deal with. TPC Sawgrass Stadium Course Hole 17: Arguably the most notable par three in the world, the island green seems so small from the tee, the golfer can’t help but feel uneasy at the fate that awaits the less than perfect shot. TPC Sawgrass Stadium Course Hole 18: This great finishing golf hole offers more of what the golfer faced all day, which is obvious danger on one side, and less desirable angles or blocked shots for those that over-correct. With the huge clubhouse in the background, it is an intimidating and impressive finish to the round.